There's usually two sides in a story: there are the good guys, and there are the bad guys. But once you really think about it, it's all perspective. You can be the hero of your story but that doesn't mean you can't also be the bad guy of another person's story. Fallen Legion tries to tell a story from two different perspectives. While this isn't the first time a game has done such a thing, this time each perspective is on a different platform. Take a look at my views on this game, and you might find something we agree on. If not, we just might have a different way of looking at things. 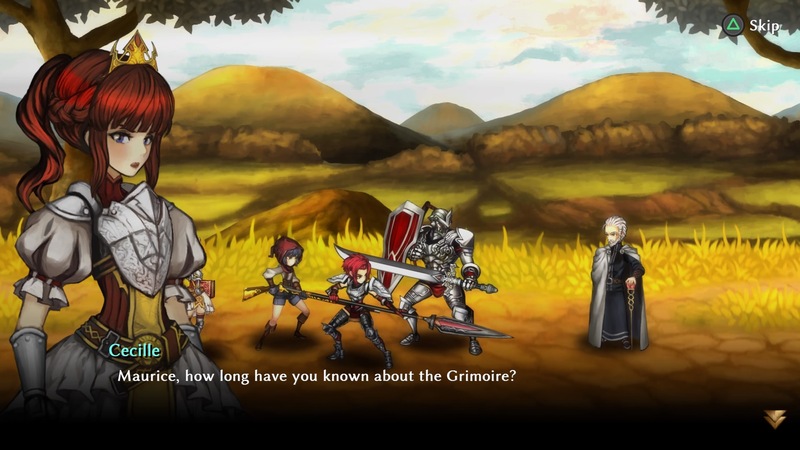 When one takes a look at Fallen Legion, they’ll very likely immediately think of the work of Vanillaware and its trademark beautifully hand-painted art style found in all of its games such as Odin Sphere and Muramasa. While this can be considered as a compliment and as a knock against the character designs of Fallen Legion, upon closer inspection one will notice that there is a more subdued style with the art. This conservative approach to the designs makes itself slightly distinct enough to be an homage rather than a ripoff. 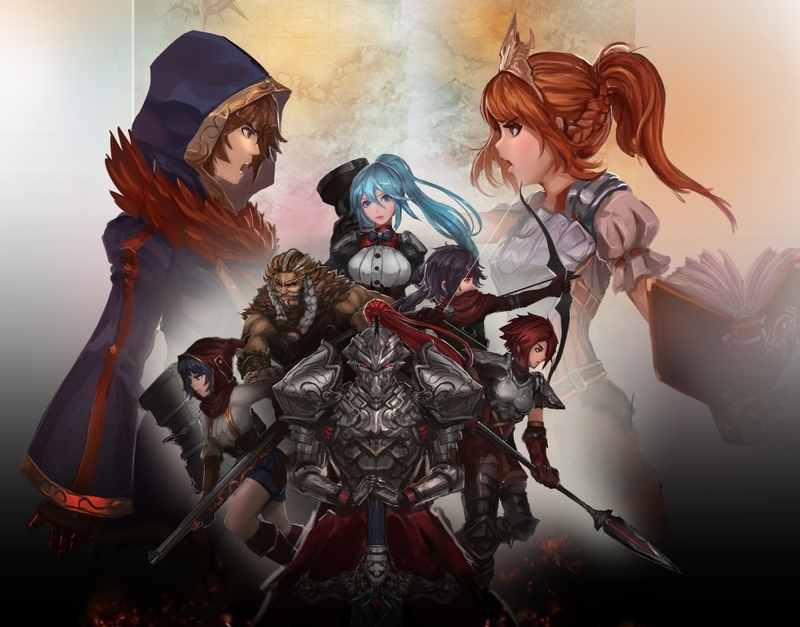 In Fallen Legion: Sins of an Empire on the PlayStation 4, players take on the role of Princess Cecille of the Fenumian Empire, who just inherited the role of emperor and must fight a rebellion led by traitorous General Legatus Laendur. 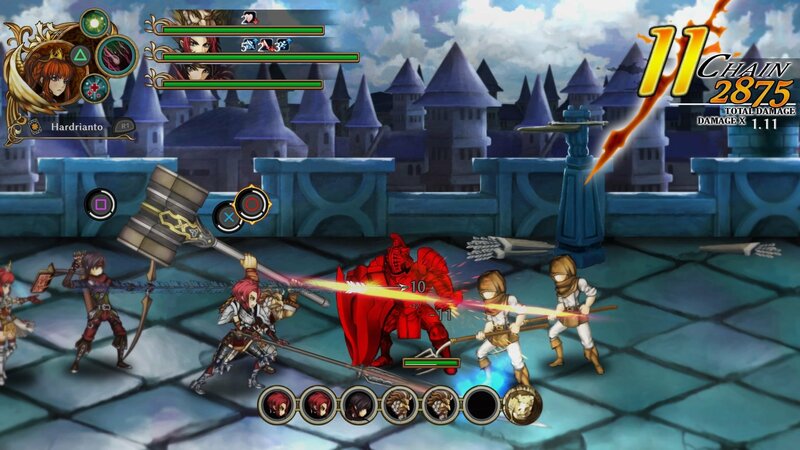 While in Fallen Legion: Flames of Rebellion for the PlayStation Vita, players get to play the opposing side as General Laendur, who seeks to overthrow the empire of Fenumia. Both games share the same world and assets but differ in the story and intertwine at certain points. Exemplars are physical manifestations of long-dead legendary heroes (hence the title Fallen Legion) that do most of the dirty work. Each Exemplar has their own combat skills and weapons for battle such as swords, hammers, bows, rifles. The main character starts with three kinds of magic: a revive spell, an attack spell, and a healing spell. Each spell will have its own gauge, which fills up over time and can be affected by certain enemies. The three Exemplars each have three attack points and each point allows a single attack, and these points recover over time once expended (only pausing while blocking). A bar on the bottom of the screen dictates how many attacks can be done per ‘turn,’ with each action represented by a circle on the bar. The number of circles starts at three and can be extended up to eight through abilities and unlocks. Attacks can be performed by pressing the assigned button which will take up a circle and make an Exemplar attack. The Exemplar whose attack falls on the final available circle will trigger that Exemplar’s ‘Deathblow.’ Deathblows are special attacks that have different effects, i.e. one Exemplar’s Deathblow can neutralize an enemy’s armor for five seconds which can allow for extra damage against said enemy. Successful attacks on the enemy without being interrupted will start chain combos, which yield a small damage bonus as the chain grows. Enemy attacks can be blocked and there is a flashing prompt that tells the player when to press the block button. Successful blocks neutralize enemy attacks, keep combo chains going, and can even reflect back projectiles. Blocking attacks can be hard, and almost impossible at times when you can’t see enemies go into their attack animation when they overlap each other. This is made even worse with all the onscreen visual effects. There is also a bit of a delay for the block, which gets frustrating during intense battles where players find themselves reacting too quickly or when foes attack too fast. My biggest complaint with the combat is readability: the screen gets too crowded, leading to a mess of stuff where I can't see what I am doing. It would tremendously improve the experience if the developers eased off the effects and kept characters from overlapping one another. Those unfamiliar with the positioning of the PlayStation face buttons might have some trouble since the combat relies on knowing where the buttons are on the controller without looking down. I know the buttons by heart after almost two decades of owning PlayStation products, but even I have trouble keeping track of the icons since I'm also looking at different parts of the screen. 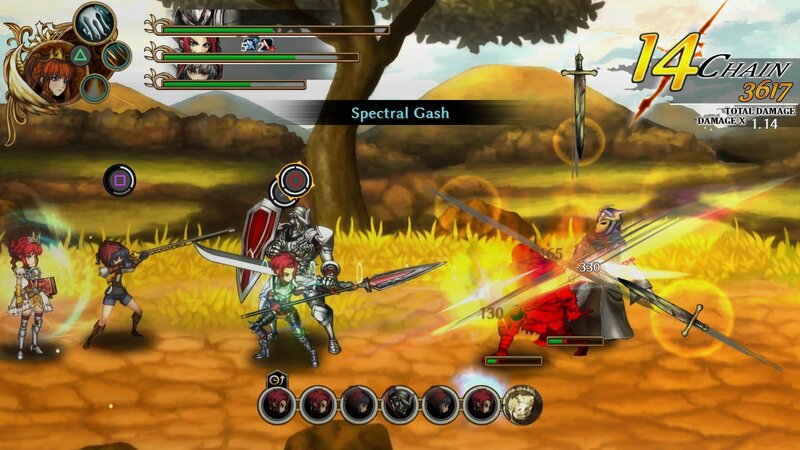 The combat system can be confusing in that way, since it consists of pressing the right buttons at the right time while looking at three different parts of the screen at all times. But when you wrap your head around the mechanics, it becomes satisfying when stuff does go right with performing combos and timing blocks. While there were instances where I ended up mashing buttons and winning, that strategy does not work with harder enemies where blocking and proper timing is essential. Progressing through the story is handled through an overworld map with points that either represent a story cutscene sequence or a battle. Battles are series of combat encounters, with some story between each encounter and choices to make with regards to the small side events happening in the world that can affect the morale of the player's army. 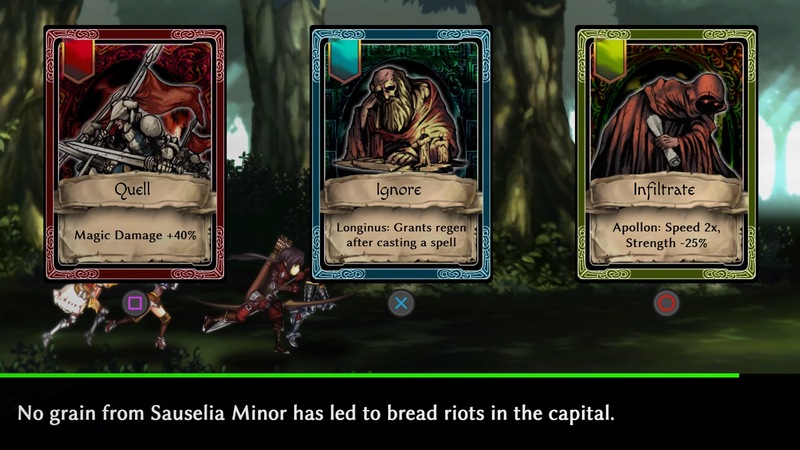 These choices, represented by three cards, can also lead to small branching stories in the minor story sequences but have no effect at all on the overall narrative of Fallen Legion. There is a timer when choosing these cards, which ties into boosts that provide aid in combat, like healing. Choosing can be tough since some of the choices that benefit the player negatively affect the morale of the player's army, which leads to missing out on other benefits in the long run. These choices can can be vague or confusing and will often ask the player to pick a side or do something that may lead to certain people hating or liking them. The game doesn’t really tell you enough about the politics and who’s who of the world in order to make the ‘best decision,’ which are sometimes like moral choices. 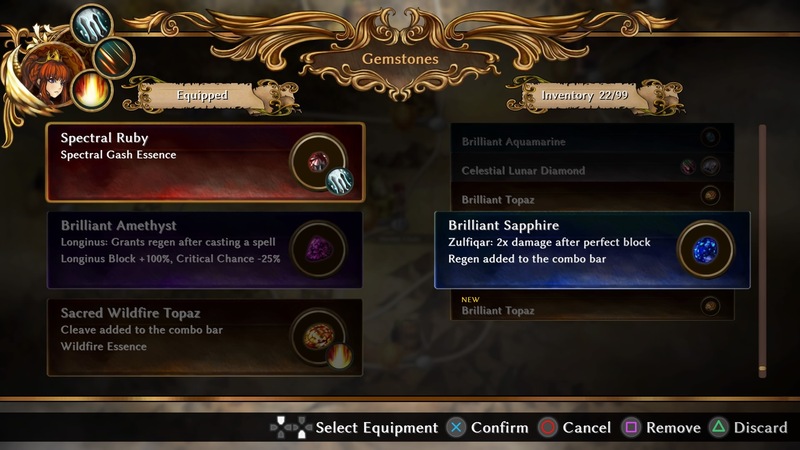 There is no leveling up but playing through the game and replaying battles will unlock boosts and gemstones to make Exemplars stronger in combat. The gemstones can equipped, but will have to be switched out since certain bonuses are character-specific. Fallen Legion has a “One Life Mode” in which there are no retries and the game ends when the main character is killed in combat after the Exemplars (which can be revived) are taken out. There is also a new game plus mode for those wanting to unlock the epilogue. These extras provide more reasons to pick it up again after a not-very-long campaign (there is no in-game timer, so I can't tell how long I played). The music is superb in Fallen Legion, to the point that I never got sick of it even after repeatedly hearing the same songs for hours. It definitely has the Japanese RPG fantasy feel down and made me think of PlayStation 1-era JRPGs. The voice acting is okay and fits the game just right, though not every part is voiced, including some seemingly important story moments. 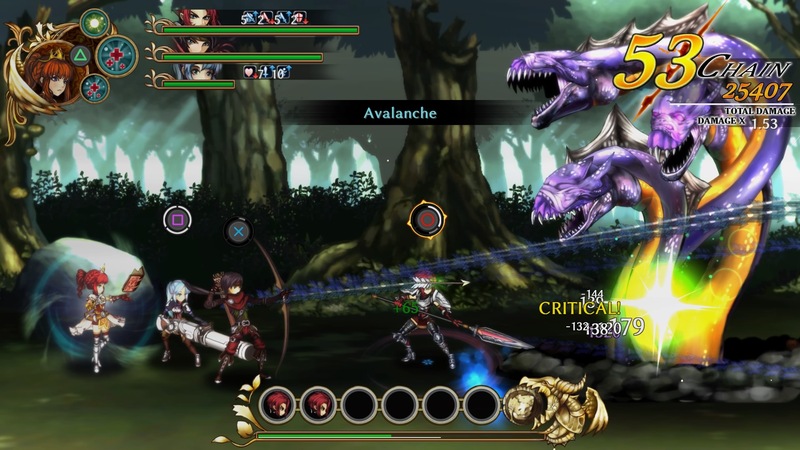 The Vita version, Fallen Legion: Flames of Rebellion, is very much identical to the PlayStation 4 version except for the story. Flames of Rebellion has a few slightly longer-than-normal load times and some performance issues that affect combat (though it might just be the game itself and has been recently updated that improved its performance). Hopefully this is fixed down the line since Flames of Rebellion cannot be played on the significantly more powerful PlayStation 4. I found the story in this version to be more interesting, probably mainly because I played the PS4 version first and saw Sins of an Empire in a different light that helped me appreciate it even more. Playing both games made me think that this was once a bigger game that got divided into two, further evidenced by the $20 price point for each version. I would not be surprised if they combined both stories of Fallen Legion into one complete package in the future, which would be nice to get the full story. I kept thinking that Fallen Legion was a much more expensive game with just how it looked and sounded. The art and music are standouts, despite their modesty. Everything else would have greatly benefited from more polish, but there is great potential in these games. I cannot wait to see what the developers make next.